Opening in 2008, Maloney’s Irish Pub is a neighborhood pub that has a little something for everyone. The Irish judge their pubs based on “craic” (Irish for atmosphere) and this pub has it. We have entertainment such as pool, darts, shuffleboard, mega-touch and volleyball leagues, a 100 inch big screen and several other screens to watch the game. 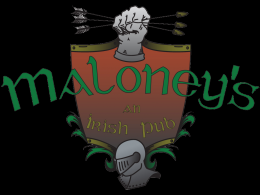 Maloney’s has a variety of beer and alcohol, as well as the largest selection of Irish Whiskey in the state of Nebraska. With a top notch staff and great drink specials, Maloney’s always makes you feel welcome.